Lots of cool people were born on Christmas. 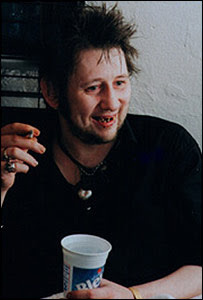 Jesus, Cab Calloway and Shane MacGowan. Some people seem shocked that Shane made it to 50. But come on, Keith Richards is past 60 and Jerry Lee Lewis is in his 70s. Personally, I'm just surprised that Shane is younger than me. Happy birthday, blessed drunkard! I'm a day late, but I bet you're still celebrating.